Ottawa, November 22, 2018 - A new report released today reveals the disconnect between Canada’s promises on climate change and the actions of its official export credit agency, Export Development Canada (EDC), in propping up the oil and gas industry. Disclosures and analysis of transaction-level data reveals that EDC provides, on average, over $10 billion in government-backed support for oil and gas companies every year. Between 2012 and 2017, EDC provided twelve times more support for oil and gas than it did for clean technologies. In the first two years of Prime Minister Justin Trudeau’s government, EDC provided more support for oil and gas (22.4 billion) than was provided during the last two years of the government of his predecessor, Stephen Harper (20.9 billion). Underwritten by Canadian taxpayers, EDC’s finance is make-or-break support for many fossil fuel businesses and large oil and gas projects. By shifting lending and insurance risk onto the Federal government, EDC provides substantial commercial and competitive advantage for domestic fossil fuel producers, alongside federal and provincial producer subsidies. Canada has repeatedly committed to phasing out fossil fuel subsidies, but has yet to announce a clear path for ending either budgetary subsidies for oil and gas, or for ending Export Development Canada’s fossil fuel finance. The report’s release comes in the midst of two ongoing reviews of EDC’s governance. International Trade Diversification Minister Jim Carr has asked EDC to thoroughly review its internal practices at the same time the government is also reviewing EDC’s governing legislation. The report shows how Canada can align EDC’s mandate with best-in-class policies and with global goals that Canada has committed to, including the Paris Agreement on climate change. EDC is falling behind the curve. In 2017, the World Bank Group established a new standard for climate leadership by ending financing for upstream oil and gas activity after 2019. Other multilateral development banks, including the African Development Bank and Asian Development Bank, have already ruled out financing for oil and gas exploration activities. Just last week, it was reported that Spain’s new climate change law would freeze and ultimately phase out both fossil fuel subsidies and government-backed investments in fossil fuels. The latest climate science calls for a rapid shift away from fossil fuels. In October 2018, the Intergovernmental Panel on Climate Change (IPCC) showed that global emissions must decline by 45 percent in just 12 years, reaching zero in just 38 years, in order to meet the goals of the Paris Agreement and provide the best chance of avoiding catastrophic impacts from climate change. 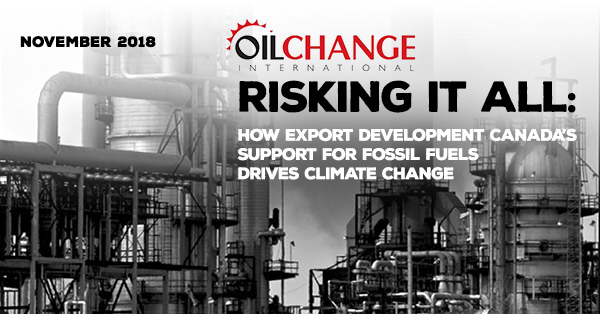 The report: “Risking It All: How Export Development Canada’s Support for Fossil Fuels Drives Climate Change” was published by Oil Change International in partnership with the International Institute for Sustainable Development, Environmental Defence Canada, Équiterre, Above Ground and Climate Action Network Canada. It can be found here. You may also read the Questions & Answers document written by Annie Bérubé, Equiterre's Director of Government Relations. EDC is a government-backed institution created to ‘support and develop Canada’s export trade by helping Canadian companies respond to international business opportunities,’ whose financial issues are backed by the full faith and credit of the Government of Canada. Every 10 years, the Minister of International Trade must initiate, as per the Export Development Act, a review of EDC's mandate and activities, in consultation with the Minister of Finance. In addition, International Trade Diversification Minister Jim Carr has requested that EDC undertake a thorough review of EDC’s ongoing risk assessments and transaction due diligence.